Santorini has been on my bucket list since I can remember, so I jumped at the first opportunity I had to visit this beautiful Greek island. 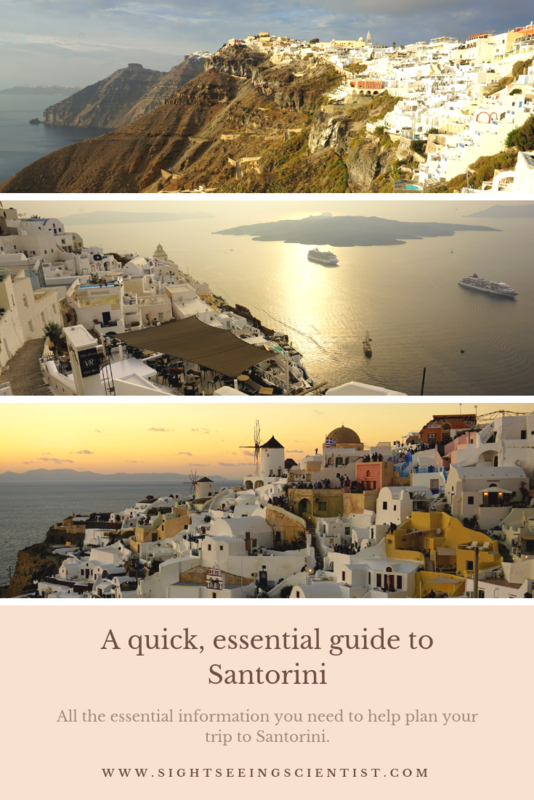 Because Santorini is such a popular destination, there are lots of guides out there. This guide is different because it strips away all the fluffy anecdotes (more personal articles to follow later) and leaves you with all the essential information to help you plan your trip. Here is my quick guide to Santorini. There are two ways to reach Santorini, by air or water. Lots of airlines like Transavia, Volotea, and Ryanair offer direct flights from many European destinations while some flights will connect through Athens. 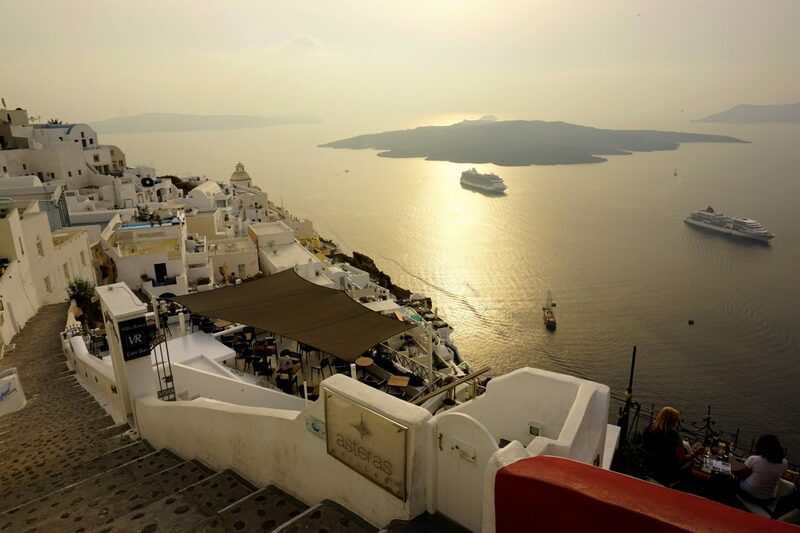 By water, you can reach Santorini via ferry from Athens (it takes about 8 hours) or nearby islands, or by cruise ship. Cruise ships anchored at Fira. This solely depends on your wants and needs. If you can afford it, stay in Oia. It’s the prettiest village but also the most expensive one. 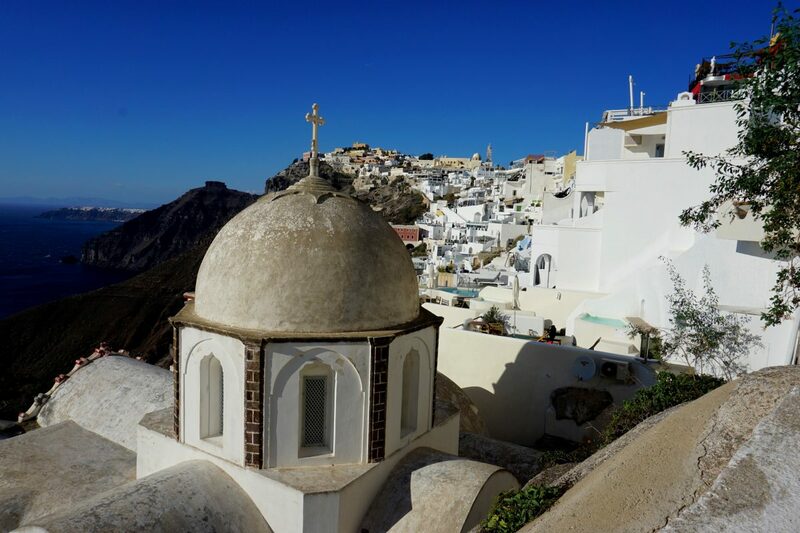 Fira or Karterados is definitely the most convenient towns in terms of location and reaching the rest of the island. If you love the beach then stay in Kamari or Perissa. Wanna get off the beaten track? Then stay in Pyrgos or Akrotiri. 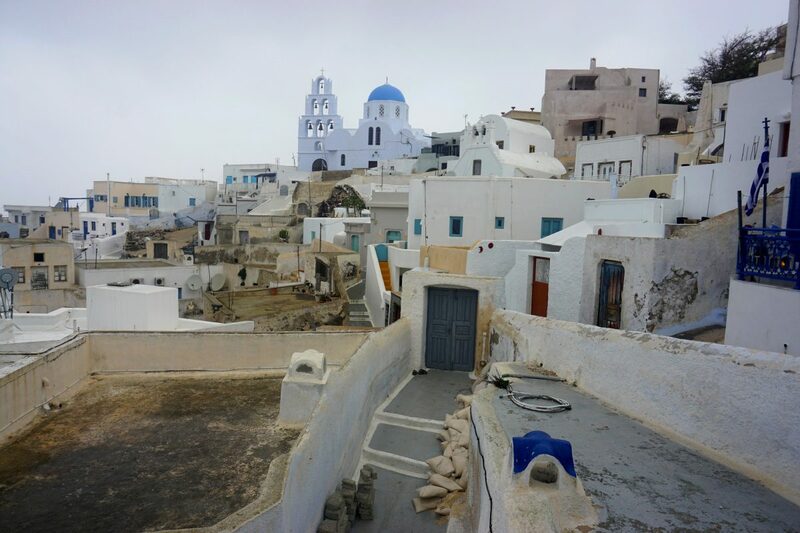 Santorini is still surprisingly affordable, but it heavily depends on the time of year you choose to visit and where you choose to stay. 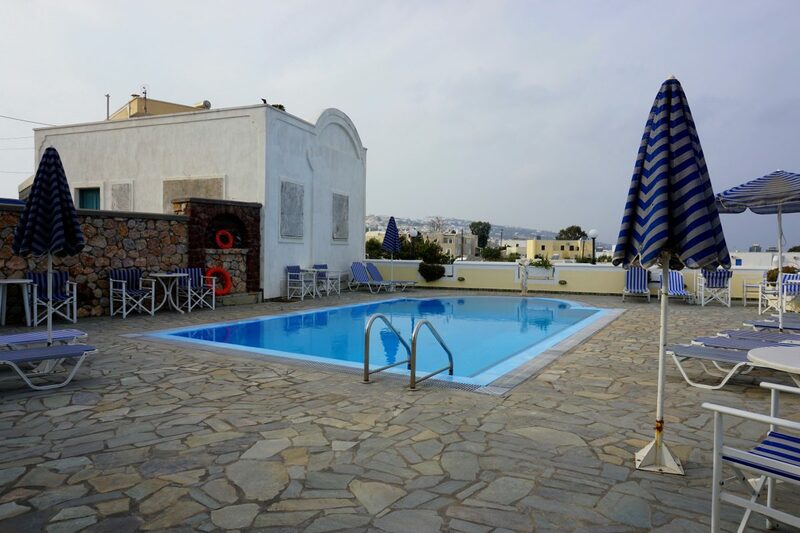 Budget travellers will be delighted to know that you can stay in a hostel room in Perissa for as little as €8 a night (this will be more expensive during peak season). If luxury accommodation is more your speed, the cave hotels in Oia can cost hundreds (even thousands) of euros a night. And then there’s the middle. I paid €26 a night for a private, single room in Karterados. Like I mentioned above, the price is dependant on when you travel and where you want to stay. You’ll need some sort of transportation to reach all the villages of Santorini. You can rent a car to explore the island. Quad bikes are also a popular option. When it comes to public transportation, the local buses are great! They run regularly, they are on time (for the most part) and definitely the most affordable way to get around the island (on average a ticket will cost €2 one way). You purchase your ticket in the cash on the bus and the attendant will shout out the stops along the way. The buses also run between Fira and the ferry terminal and the airport. Do a hike! 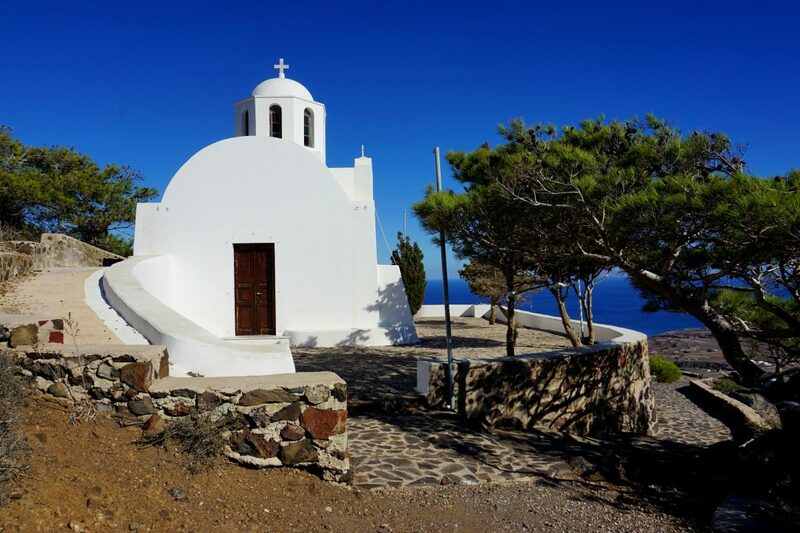 There are plenty of trails to choose from, but the most popular one is the hike between Fira and Oia. 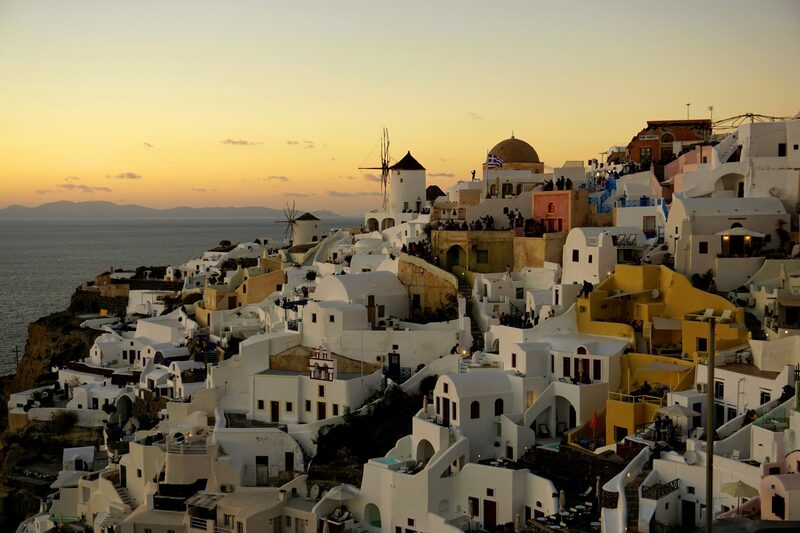 Watch the sunset in Oia. Just do it! It’s an experience. Buy local products. Stock up on olive oil, soap, spices, and ouzo. Check out the black beaches of Kamari and Perissa. 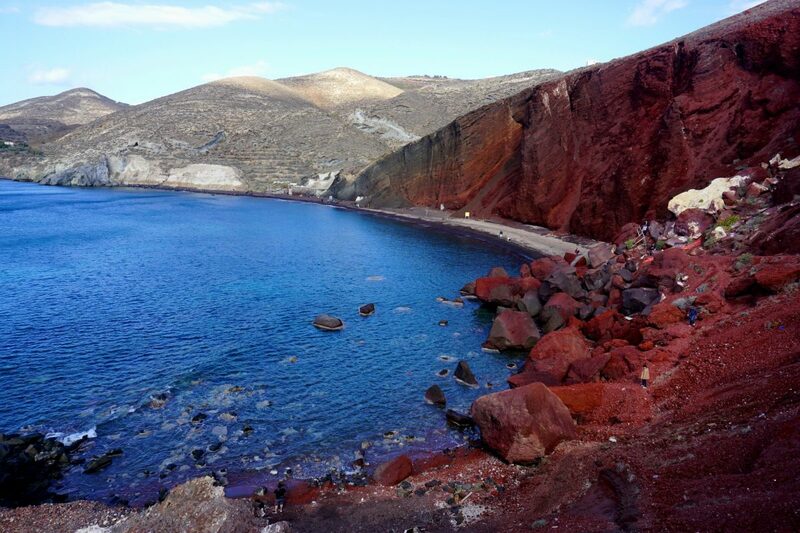 Don’t miss the red beach at Akrotiri. Visit the Prophet Elias Monastery, the highest point on the island. This is the only viewpoint where you can see the whole island. The beautiful red beach at Akrotiri. Greek cuisine is delicious (so eat as much as you can)! Your best budget options are gyros (if you eat meat), falafel pitas (the vegetarian/vegan alternative) or local pies (I highly recommend the cheese or spinach and cheese pies). Gyros cost about €2 while falafel pitas cost between €3 to €5. A piece of pie costs around €2. If you eat in a restaurant, a starter will cost between €5 and €10, while the main course is around €10 (more if you eat fish or meat). Just to illustrate, I paid €20 for a vegetarian starter, a vegetarian main course and a glass of red wine at a restaurant in Kamari. Also, expect to pay more for restaurants with views. One last thing, the tap water on Santorini is not potable, so you’ll have to buy water at the supermarket. 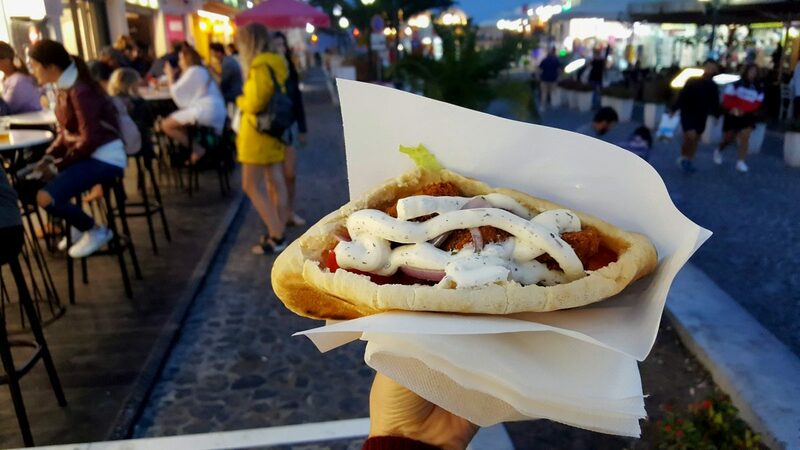 Eating a falafel pita in Fira. Santorini is open for business from March to the end of October. Peak season is during July and August when the weather is perfect, but the island is flooded with people and the prices are sky high. The best time to visit Santorini, according to a local, is towards the end of September. The weather is pleasant but not too hot and the crowds have dwindled down. I visited during October and although the weather was too cold to swim, it was perfect for hiking. I’d say three to four days is enough time to see and explore all that Santorini has to offer. One or two days is way too short. But if you can, definitely stay longer (I stayed on the island for eight nights). Have you been to Santorini? I’d love to hear from you. Share your best tips with me below.